Epidemiologic data suggest that OSA is over-represented in patients with coronary artery disease (CAD). OSA is an easily treatable disease and its early identification and treatment in patients with CAD will help to reduce the occurrence of MI. There are no studies on the prevalence of OSA in patients with CAD from India. In this article, we describe our experience with the occurrence of OSA in patients with a recent coronary event in a tertiary care hospital in the South India. We screened all consecutive patients admitted in the cardiology wards with MI over 1 year (i.e. from November 2011 onward) using a carefully designed protocol. Detailed history regarding onset of pain, duration of admission, history of co-morbid illness, smoking and alcohol history, drug history (including β-blockers and sedatives) was taken and a brief clinical examination according to the protocol was carried out. A questionnaire regarding snoring, apneic episode during sleep, non-restorative sleep, nocturia, morning headaches, insomnia, epworth sleepiness score (ESS), and Berlin questionnaire was administered. Required lab investigation reports were also collected. Patients in congestive cardiac failure (ejection fraction < 35%) were excluded from the study as there is evidence showing the incidence of central sleep apnea in such patients. Hemodynamically unstable patients and patients with a prior diagnosis of OSA were also excluded. The study was approved by the institutional review board and all patients provided written informed consent. Sleep studies were performed using a 12-channel in-hospital polysomnography (PSG) (Rembrant software) for quantifying sleep-disordered breathing. The parameters measured included electroencephalogram, electro-oculogram, chin electromyogram, nasal airflow (nasal cannula), thoracoabdominal movements (induction respiratory bands), arterial oxygen saturation (pulse oximetry), snoring episodes, limb movement, and electrocardiography. Respiratory events were defined according to the revised American Academy of Sleep Medicine (AASM) criteria. An apnea was defined as cessation of airflow of >10 s, and hypopnea as a >50% reduction of airflow lasting >10 s. An event was also considered to be a hypopnea when there was a reduction in airflow that did not reach the 50% criteria, but was associated with an arterial oxygen desaturation of >4%. Apneas are classified as obstructive if there was thoracoabdominal movement and as central if there was no thoracoabdominal movement. The apnea-hypopnea index (AHI) was calculated as the number of apneas and hypopneas per hour of recording time in bed, with the start of recording at stage 1 NREM sleep. The end of the recording time was the waking time recorded by the subject. An AHI of 15 events/h was considered clinically significant for the purpose of this study. The data are presented in a descriptive fashion as the mean (SD) or the median (range). Univariate association between (MI) and OSA-positivity as well as other patient-related risk factors (e.g., diabetes and hypertension), which were recorded as categorical variables were evaluated using the Fisher exact test. For continuous risk factors, the t-test or the Wilcoxon rank sum test was used. Data were statistically analyzed using the Statistical Package for the Social Sciences (SPSS for Microsoft Windows, package version 14; SPSS Inc.; Chicago, IL, USA). Assuming a two-sided test, the statistical significance was pegged at a P < 0.05. During the study period, a total of 55 patients who were admitted with acute MI were screened [Figure 1]. Eight patients met the exclusion criteria. An overnight sleep study was done in 44 patients and completed in 42 patients. The sleep study was not satisfactory for analysis in the remaining two patients as they had slept for less than 3 hours. The mean (±SD) age was 57.5 ± 10.44 years and the majority of patients were males (n = 47, males = 37, 78.7%) [Table 1]. Twenty three patients (48.9%) were smokers, significantly higher than seen in the general population and 11 (23.4%) patients gave a history of alcohol abuse. The most common type of MI seen in these patients was anterior wall MI seen in 24 patients (51.1%). 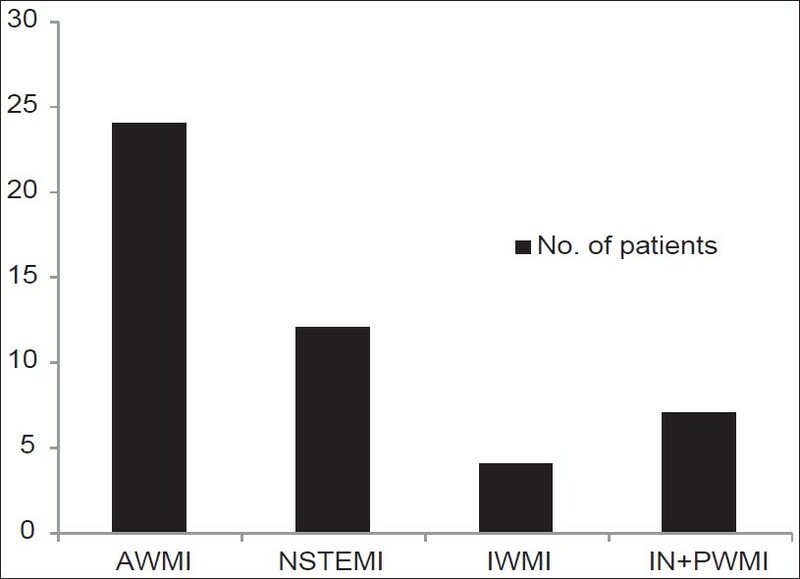 The next most common type of MI was the non-ST elevation MI seen in 12 patients (25.5%) [Figure 2]. A total of 17 patients (36.1%) gave a history of nocturnal chest pain leading to infarction. There were no significant differences between the OSA-positive and the OSA-negative groups with regard to the percentage of patients presenting with nocturnal chest pain (P = 0.763). Most of them had single (18 patients, 38.3%) and two vessel disease (16 patients, 34%). Six patients (12.7%) had triple vessel disease. Eight patients (17.02%) were managed conservatively and did not undergo coronary angiogram. The pattern of involvement of coronary arteries was similar in the OSA-positive and the OSA-negative group. A total of 11 patients (23.4%) gave family history of CAD. The distribution of patients with family history of CAD was comparable in OSA-positive and the OSA-negative group. The other sleep disturbances noted in this patient population were insomnia in 14 subjects (24.5%), sleep talking in 1 subject, and symptoms suggestive of restless leg syndrome in two subjects. 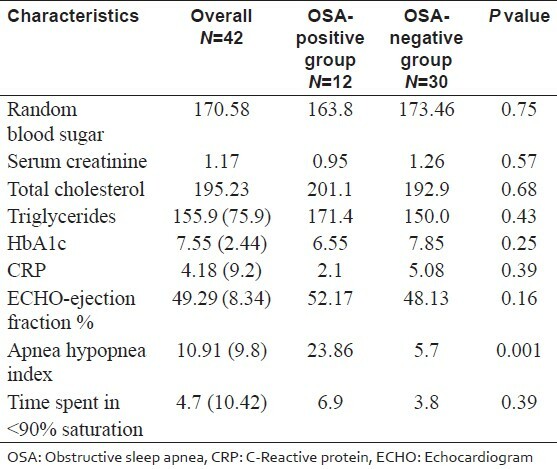 Seventeen patients had an ESS of >10 out of whom 7 were confirmed to have OSA and 7 patients were negative for OSA. Three subjects did not undergo PSG. ESS was significantly higher in patients with OSA (P value −0.03). A total of 12 (28.6%) of the 42 patients had OSA with an AHI of > 15. The median AHI for the OSA-positive group was 19.8 events/h. The prevalence of OSA was significantly higher as compared to the general population (P value −0.001). The mean blood sugar was 170.58 mg ± 86.12 (95% confidence interval [CI] of 142.03-197.12 mg). The mean total cholesterol was 195.23 ± 58.5 (95% CI of 176.5-213.94 mg) [Table 2]. Among the 42 patients who completed the overnight sleep study, AHI ranged from 1.0 to 41.5 events/h. AHI was > 15 events/h in 12 patients, giving an occurrence of OSA of 28.6% in this population. The occurrence increased to 16 (38.1%) and 27 (64.2%) when the cut-off for OSA was lowered to AHI of 10 and 5/h respectively. The median AHIs for the OSA-positive and OSA-negative groups were 19.8 and 4.9 events/h respectively (P < 0.001). Udwadia et al. reported the prevalence of OSA and OSAS as 19.5% and 7.5% respectively, in urban Indian males, using a cut off of AHI 5 or more per hour. The prevalence of OSA and OSAS in the population based-study done by Sharma et al.,  were estimated to be 13.7% and 3.6%, respectively. The present study showing an OSA occurrence of 64.2% using the same criteria and is comparatively much higher. In India, the prevalence of IHD and cardiovascular morbidity is high. It is hence important to identify factors that may be associated with this increased risk. The prevalence of OSA in the general population ranges from 3.6% to 7.5% in Indian studies. This study found a high prevalence of previously undiagnosed OSA in patients with acute MI as compared to general population. The occurrence of OSA was 28.6% using an AHI of 15 events/h as the cutoff. The occurrence increased to 38.1% and 64.2% when the cutoff was lowered to AHI of 10 and 5/h respectively. This is comparatively lower than the prevalence of 65.7% (AHI cutoff ≥ 15) reported by Lee et al. In a study of Japanese patients admitted to the hospital with acute MI, Nakashima et al. reported a prevalence of 43%. However, in their study, the sleep study was done 14-21 days after hospital admission, whereas in ours, it was done 5-7 days after hospital admission. Skinner et al. reported the prevalence of sleep disordered breathing of 50% and OSA of 46% in 26 patients admitted with acute coronary syndrome using a portable sleep study. The prevalence of OSA dropped to 28% when the sleep study was repeated at or more than 6 weeks after discharge. In two other studies done by Mehra et al. and Yumino et al. using a lower AHI cutoff of 10, the prevalence of OSA in patients with acute coronary syndrome ranged from 57% to 66.4%. A lower threshold in our study also increases the number of patients with OSA to 64.2%. 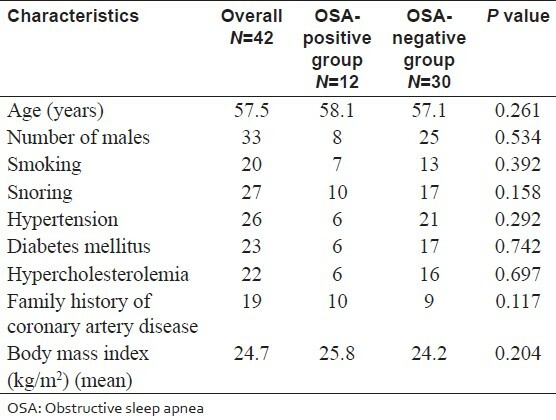 Differences in the prevalence of OSA between current and the previous studies may be due to: (1) Differences in the timing of sleep studies (PSG after number of days following MI), (2) diagnostic criteria applied (revised AASM criteria used in this study), (3) diagnostic device used (lab vs. portable sleep studies), and (4) characteristics of the study population (South Indians vs. patients from New Zealand and Singapore) as compared to the studies quoted above. These factors have affected the measurement of prevalence of OSA in our study, resulting in lower estimation. In addition, a large number have refused to participate in the study and could have affected the outcome. Despite this limitation, the prevalence of OSA is higher in patients with MI as compared to the general population. Predominantly males were diagnosed with OSA in this study. This is probably because more males consented to the study. Significant number of study subjects was smokers and gave history of habitual snoring, even though no difference in smoking history or snoring was noted on subgroup analysis between OSA positive and negative group. Higher percentage of patients had diabetes, hypertension and hypercholesterolemia as compared to general population, but the prevalence was comparable between the OSA positive and negative group. CRP was significantly high in the study patients, but was comparable between the OSA positive and negative group. Certain markers of inflammation are known to decrease with treatment in patients with OSA. Thus OSA may be an additional reversible risk factor and hence needs to be looked into while evaluating patients with CAD. The occurrence of undiagnosed OSAHS (28.6%) is high in patients admitted with acute MI. This is significantly high as compared to 3.6% prevalence of OSA in Indian general population. Early recognition of undiagnosed OSA in this population of patients with CAD, and treatment of the same would help in reducing cardiovascular morbidity and mortality. This study was carried out on a small number of patients with MI and hence does not have enough statistical power to translate prevalence of OSA in all patients with MI. Larger number of patients are required to establish the association or causal relationship between OSA and MI. In the general population, the ratio of male to female patients with OSA is estimated to be about 2:1-3:1. The study group predominantly comprised of males. 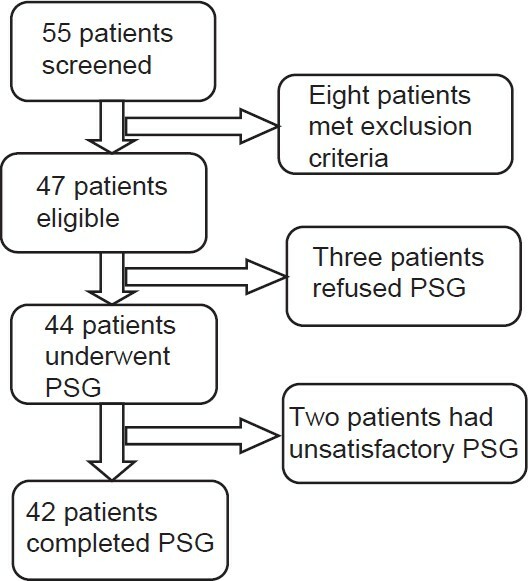 There could be a selection bias as many female patients interviewed denied consent for PSG. 1. Parish JM, Somers VK. Obstructive sleep apnea and cardiovascular disease. Mayo Clin Proc 2004;79:1036-46. 2. Udwadia ZF, Doshi AV, Lonkar SG, Singh CI. Prevalence of sleep-disordered breathing and sleep apnea in middle-aged urban Indian men. Am J Respir Crit Care Med 2004;169:168-73. 3. Mooe T, Rabben T, Wiklund U, Franklin KA, Eriksson P. Sleep-disordered breathing in women: Occurrence and association with coronary artery disease. Am J Med 1996;101:251-6. 4. Mooe T, Rabben T, Wiklund U, Franklin KA, Eriksson P. Sleep-disordered breathing in men with coronary artery disease. Chest 1996;109:659-63. 5. Hung J, Whitford EG, Parsons RW, Hillman DR. Association of sleep apnoea with myocardial infarction in men. Lancet 1990;336:261-4. 6. Sharma M, Ganguly NK. Premature coronary artery disease in Indians and its associated risk factors. Vasc Health Risk Manag 2005;1:217-25. 7. Sharma SK, Kumpawat S, Banga A, Goel A. Prevalence and risk factors of obstructive sleep apnea syndrome in a population of Delhi, India. Chest 2006;130:149-56. 8. Saito T, Yoshikawa T, Sakamoto Y, Tanaka K, Inoue T, Ogawa R. Sleep apnea in patients with acute myocardial infarction. Crit Care Med 1991;19:938-41. 9. Andreas S, Schulz R, Werner GS, Kreuzer H. Prevalence of obstructive sleep apnoea in patients with coronary artery disease. Coron Artery Dis 1996;7:541-5. 10. Dincer HE, O'Neill W. Deleterious effects of sleep-disordered breathing on the heart and vascular system. Respiration 2006;73:124-30. 11. Lee CH, Khoo SM, Tai BC, Chong EY, Lau C, Than Y, et al. Obstructive sleep apnea in patients admitted for acute myocardial infarction. Prevalence, predictors, and effect on microvascular perfusion. Chest 2009;135:1488-95. 12. Nakashima H, Katayama T, Takagi C, Amenomori K, Ishizaki M, Honda Y, et al. Obstructive sleep apnoea inhibits the recovery of left ventricular function in patients with acute myocardial infarction. Eur Heart J 2006;27:2317-22. 13. Skinner MA, Choudhury MS, Homan SD, Cowan JO, Wilkins GT, Taylor DR. Accuracy of monitoring for sleep-related breathing disorders in the coronary care unit. Chest 2005;127:66-71. 14. Mehra R, Principe-Rodriguez K, Kirchner HL, Strohl KP. Sleep apnea in acute coronary syndrome: High prevalence but low impact on 6-month outcome. Sleep Med 2006;7:521-8. 15. Yumino D, Tsurumi Y, Takagi A, Suzuki K, Kasanuki H. Impact of obstructive sleep apnea on clinical and angiographic outcomes following precut aneous coronary intervention in patients with acute coronary syndrome. Am J Cardiol 2007;99:26-30.